It’s no secret that Disney World offers a myriad of magical experiences for families. But did you know you can enjoy many memorable moments on the Walt Disney World resort property beyond the theme park gates? 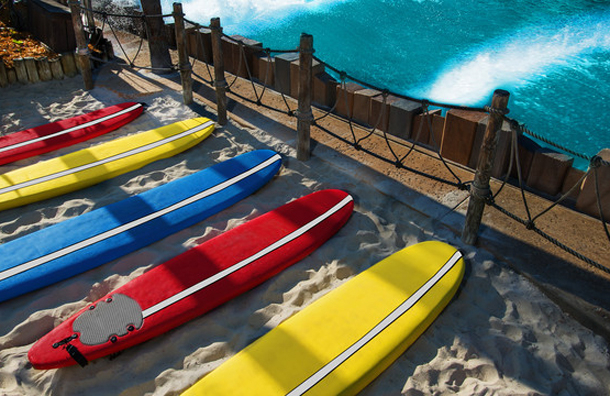 From horseback riding and surfing lessons to family fireworks cruises and racecar ride-alongs, Disney presents an extensive itinerary of entertaining options for kids and families — no passes required. If you like the idea of camping, but aren't fully committed to the effort that a back-to-nature-escape entails, Disney's Fort Wilderness Resort & Campground may be your solution. See for yourself on an excursion to the popular Magic Kingdom area resort, which offers a full-range of accommodations, from tent sites to fully furnished cabins, as well as perhaps the most extensive array of recreational amenities for families at any Walt Disney World Resort property. 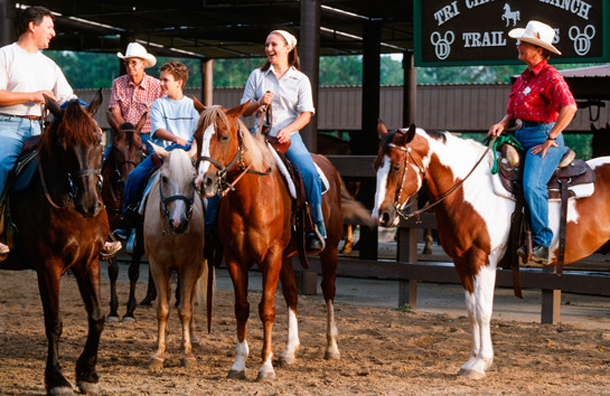 At Tri-Circle-D Ranch, little ones can ride a pony (walk-up system), while kids ages 9 and up can sign up for a 45-minute trail ride (reservations recommended.) For the adventurous, there are archery lessons (ages 6 and up), Disney World fishing excursions (catch-and-release style) and Segway tours (ages 16 and up). At the Bike Barn, you can rent bikes or an electric cart for the day, and explore the 700-acre property. If your time is more limited, you can take a wagon ride, traveling through the camping loops, where overnight guests are known to lavishly decorate sites during the Fourth of July, Halloween and Christmas holidays. You can even sign up for a sleigh ride, offered exclusively at Fort Wilderness during the winter season. No matter what time of year you go, be sure to pay a visit to Chip and Dale's Campfire Sing-A-Long, a marshmallow roast and character meet-up, which is followed by a free screening of a kid-friendly Disney movie. Both events are open to guests of all Disney resorts. Hands-down one of the most enjoyable special experiences for families at Disney World is Disney's Pirates and Pals Fireworks Voyage, which brings multiple generations together for an explosive evening on the Seven Seas Lagoon. Hosted by Patch the pirate, and including a pre-cruise sweet and salty snack buffet, visits with Captain Hook and Mr. Smee and a special viewing of Magic Kingdom's Wishes Nighttime Spectacular fireworks show, this after-dinner event is a great way to end a magical day. The cruise departs from the marina at Disney's Contemporary Resort. 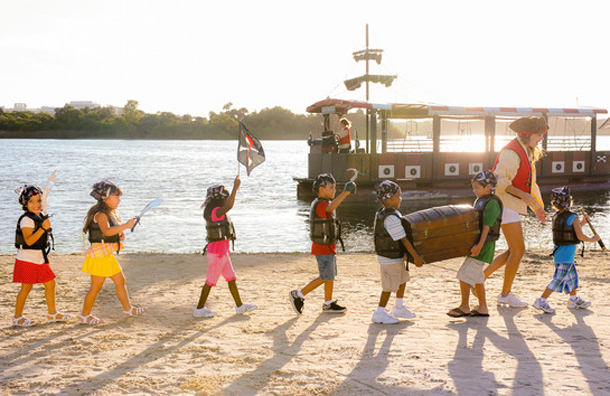 For kids who need an earlier bedtime, Disney offers four daytime Pirate Adventure cruises. Designed for children ages 4 to 12, these kids-only, scavenger hunt-style excursions feature fun and treasure, as well as a snack and drink. Departure points include Disney's Grand Floridian Resort for the Disney Pirate Adventure, Disney's Caribbean Beach Resort for the Islands of the Caribbean Pirate Cruise, Disney's Yacht and Beach Club for the Albatross Treasure Cruise and Disney's Port Orleans Resort - Riverside for the Bayou Pirate Adventure. Call 407-WDW-PLAY for reservations. If your idea of fun and adventure on the "high seas" involves more of a hands-on approach, head to Disney's Contemporary Resort, overlooking beautiful Bay Lake. 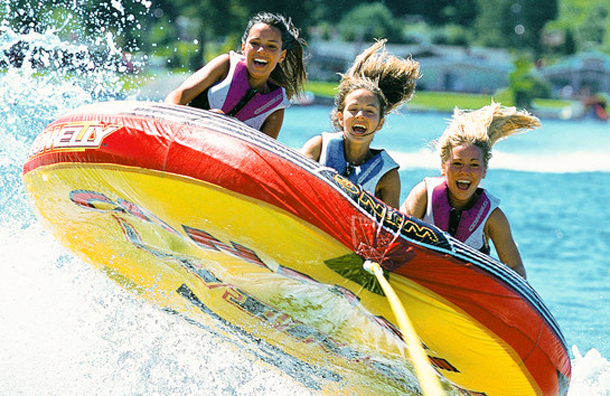 At Sammy Duvall's Watersports Centre, you can book a parasailing, water-skiing, tubing or jet-ski adventure. Combo tours (tubing and skiing) are also available. The Contemporary Marina also offers hourly, motorized boat rentals. While you must be 18 or older to steer a ski boat, kids ages 12 and up can drive a Sea Raycer (also known as a water sprite) solo -- a nice option if you're looking to commemorate a special accomplishment or landmark occasion, like a good report card or saying goodbye to braces. Sea Raycer, ski boat and pontoon boat rentals are available at all deluxe Disney resort marinas, including the Bayside Marina at DisneyÃƒÆ’Ã‚Â¢ÃƒÂ¢Ã¢â‚¬Å¡Ã‚Â¬ÃƒÂ¢Ã¢â‚¬Å¾Ã‚Â¢s Yacht & Beach Club Resorts, Teton Boat Rentals at DisneyÃƒÆ’Ã‚Â¢ÃƒÂ¢Ã¢â‚¬Å¡Ã‚Â¬ÃƒÂ¢Ã¢â‚¬Å¾Ã‚Â¢s Wilderness Lodge, Mikala Canoe Club at Disney's Polynesian Resort and at DisneyÃƒÆ’Ã‚Â¢ÃƒÂ¢Ã¢â‚¬Å¡Ã‚Â¬ÃƒÂ¢Ã¢â‚¬Å¾Ã‚Â¢s Fort Wilderness Marina. 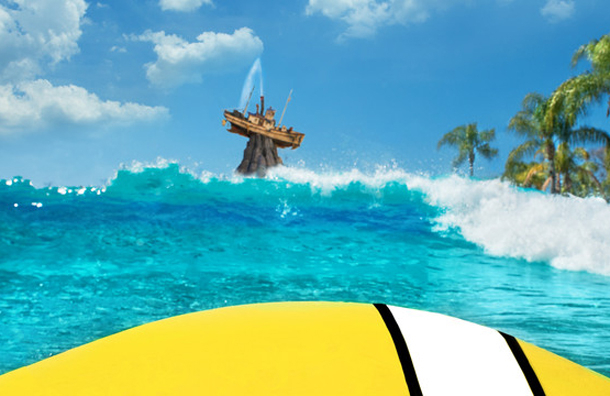 For a truly wet and wild adventure, surf over to Disney's Typhoon Lagoon Waterpark, where, on select mornings prior to park opening, you can learn to catch a wave with the pros. Small group lessons include professional instruction on dry land, followed by plenty of practice navigating 6-foot swells in the water park's wave pool. Private lessons are also available. Call 407-939-7529 for pricing and reservations. Got a school-aged "Cars" fan in your crew? 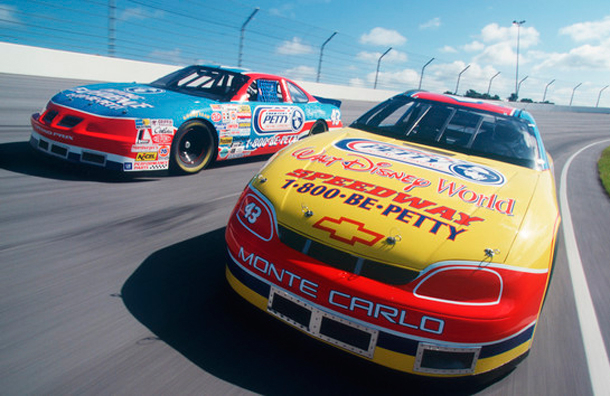 Stoke their need for speed at the Richard Petty Driving Experience at Walt Disney World Speedway. A Piston Cup Junior Ride-Along program allows kids ages 6 to 13 (minimum height is 48-inches) to ride shotgun with a professional driving instructor for three thrilling laps around the track in a character-themed, kid-outfitted Piston Cup race car. Teens ages 14 to 17 can participate in a typical NASCAR ride-along, with an accompanying parent. Advance reservations are not required for Junior Ride-Along experiences during track hours (generally 9 a.m. to 4 p.m.) and are available on a first-come, first-served basis. Visit www.drivepetty.com or all 800-237-3889 for details. A leisurely stroll along Disney's BoardWalk, set on the shores of Crescent Lake, is a carefree way to spend a morning or a fair-weather evening. If you prefer fun on wheels, in front of Disney's BoardWalk Inn, you can rent a surrey bike and pedal along with the whole family. Surrey bike rentals are available by the half-hour and you can choose a one-bench (seats three) or two-bench (seats six) model. Teton Bike & Boat Works at Disney's Wilderness Lodge is another good rental option for families. 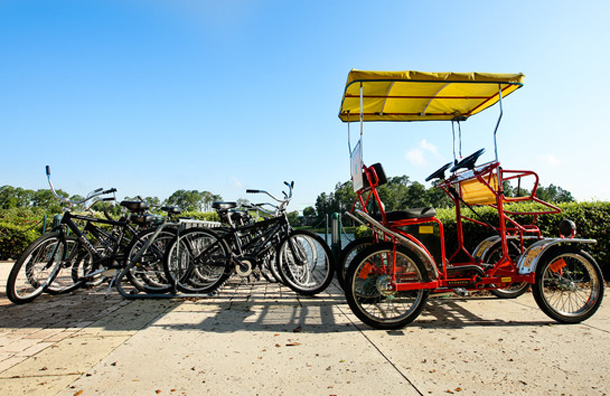 Rent traditional bikes for the whole crew (baby bike seats are available) and take a scenic trip along the path, which connects Disney's Wilderness Lodge and Disney's Fort Wilderness Resort & Campground. While the Disney Springs entertainment district (formerly called Downtown Disney) offers a number of splurge-worthy ticketed options for families, such as DisneyQuest, a virtual reality park; Cirque de Soleil's La Nouba; and Fork and Screen at AMC 24, a dine-in movie theater, some additional activities cater to the impromptu or offsite visitor. At aerial attraction Characters in Flight, you can board a tethered balloon and ascend 400 feet in the air to enjoy a view of Epcot, Disney's Hollywood Studios and Disney Springs attractions. If ground-based amusements are more your style, roll over to Splitsville Luxury Lanes, an upscale bowling alley with 30 bowling lanes (bumpers available), kid-friendly dining options and "luxury"prices. If you want to surprise your little princess with a makeover, but don't want to take time away from her magical day at the Magic Kingdom, consider making an appointment at Bibbidi Bobbidi Boutique at Disney Springs. Larger than the magical makeover salon's other location at Magic Kingdom's Cinderella Castle, the Disney Springs venue features Fairy Godmothers-in-Training, like the Magic Kingdom salon, as well a full photo studio, a site for princess photo shoots and family PhotoPass sessions. Made-over royalty is extended an invitation to join an afternoon Princess Parade, which ends with a group ride on the Disney Springs carousel. Call 407-939-7895 for reservations.